I’ll admit that Linda Howard is on my automatic-buy list. She’s just awesome. So when I spotted this new one, I didn’t even read the back, I just bought it. Turns out that this book is more romance than mystery. Lately, Linda Howard had been moving towards mystery–to the dismay of this reader–but this book was a return of good, old romance. A change in the right direction, in my humble opinion. Troublemaker is the story of Bo, our feisty chief of police heroine, her sweetie dog, Tricks and Morgan, a team leader of a paramilitary group, our hero. When Morgan gets ambushed and shot, his boss sends him to stay with Bo and recover in her sleepy, little town. When she first sees the deadly-sick man at her doorstep, Bo throws a fit, but finally has to give in. And both chaos and romance ensue. There’s a little bit of fish-out-of-water challenges here because Morgan is way in over his head in this tiny town of quirky characters. Add to that the comical antics of Tricks and I laughed out loud at some parts. But the best part was, of course, the romance. Bo and Morgan fall for each other without realizing it in a way that’s almost funny. He’s not used to her ways and she’s definitely not used to his, so they start out not liking the other and basically realize they’re in love long after it happens. It’s lovely and I won’t destroy it by trying to explain it here. There’s also mystery, which always does me in and makes me super anxious. I’m someone who never sees those twists coming or how things are going to get better. In my head, I was terrified for all three, Bo, Morgan and even Tricks. If you’re like me, rest assured, there’s a happy ending for all of them. If you’re a Linda Howard fan, you won’t be needing my recommendation, because you know what she’s like but if you have never tried her, I recommend you give this one a shot. It’s romance with a little mystery and a wonderful pet. I couldn’t ask for more than that in a great book. Note: to go to buy links, click on book cover. 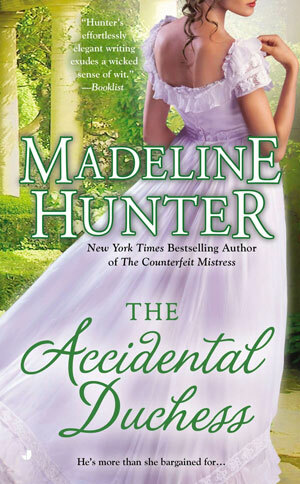 Madeline Hunter is one of my favourite authors for historical romance. She’s truly a pro and that genre is all that she writes. The Accidental Duchess was no exception. Check it out at her site: madelinehunter.com. Lady Lydia Alfreton is in a fix. Once upon a time she wrote a work of fiction and a nasty man is blackmailing her for money in order to get it back. Desperate to obtain the manuscript and keep her virtue (something really important back then to a Lady of the ton), she agrees to an old wager against the Duke of Penthurst. Now, Lydia is no fool. She only agreed to the wager because she’s incredibly lucky at cards and knows she’s going to win but the impossible happens and she loses. Now, her fix has doubled. She has that horrid blackmailer on her tail and a Duke at her elbow determined to collect the winnings of the bet. No worries, it all works out in the end, it is romance after all, but there are more than a couple of twists and turns. This is a very active version of historical romance. Lydia is pretty smart and she comes up with all sorts of ways to keep her pursuers at bay (some quite funny) but one in particular ends up catching up with her. The Accidental Duchess was a delight in many ways. There’s humour, something that doesn’t often happen in historical romance. The characters are awesome and very credible. The dialogue is definitely a slice of the time period and completely transported me back there. We have a strong, alpha hero and an intelligent, determined heroine. It’s like having a taste of Regent history without leaving your home. Delicious. I would certainly recommend it to fans of historical romance. And, if you’re one and haven’t discovered Madeline Hunter, give her a shot. She’s really one of the best in the genre. Note: click on the link to go to site. Shelter Mountain by Robyn Carr isn’t the second book in the Virgin River Series but I had to read it. It tells the story of Preacher, a gentle, giant of a man and I skipped a book in the series to read it. I fell in love with this character in the first book and I couldn’t wait to read his story. Shelter Mountain introduces us to Paige who arrives at Virgin River with her adorable little son desperate for help. She’s on the run from her ex-husband and had bruises covering her body to prove her reasons for leaving. It was hard to read about her wounds and even more to read how wounded her spirit was. She flinched, startled at loud noises, couldn’t trust people and did all the things victims of trauma do. I thought Robyn Carr treated the subject really well. Paige was realistic. She didn’t go from traumatized to recovered overnight and she certainly didn’t bounce back into romance after being in an abusive relationship. I loved that Preacher was her hero. He’s as gentle with her as he’s big in life and I knew she was in good hands. The one who didn’t seem to think so was Preacher. He was terrified of hurting her and spent a lot of the story coming to grips with his attraction to Paige. Since this gave her time to grow to trust and appreciate the town, I thought it was just right. There were old characters here and new stories for them that didn’t distract from the main love story. Robyn Carr created a wonderful place with Virgin River and I loved the happy ending she gave Preacher. I really thought he and Paige were a match made in heaven. Shelter Mountain is a great read. At 395 pages it’s thick enough to be interesting and for me to know I was going to spend some quality time with those characters. It’s also a good stand alone. Keeping the books in order is not a necessity as the backstories are gently woven into this one. I would recommend it to contemporary readers of romance and those who are looking for a good summer read. Note: click on book to go to site. What an awesome list! Check out this great post! I read everywhere I go. If I’m eating, I probably have a paperback in one hand and a fork in the other. If my husband is watching TV, I’m probably sitting next to him, reading. I take my books to work (not a good idea) and even brought a book to work out (another bad idea). So, when I stop eating, or watching TV or whatever it was that I was doing, I leave my book on the nearest flat surface…and promptly forget I did so. Now I don’t just read one book. I have one new book that I’m seriously reading (first time through it), one I’m rereading for fun (read that one when there’s distractions) and one I’m reading for inspiration (that one is in my office) and, well, you get the idea. I usually have 4 or 5 books on the go. That means I leave a trail of books pretty much wherever I go. Like little breadcrumbs. Once done, the books do go back to their rightful place in my bookshelves but, until then, they live in far away places like shelves, tables and side tables, usually lying right on top of another book. 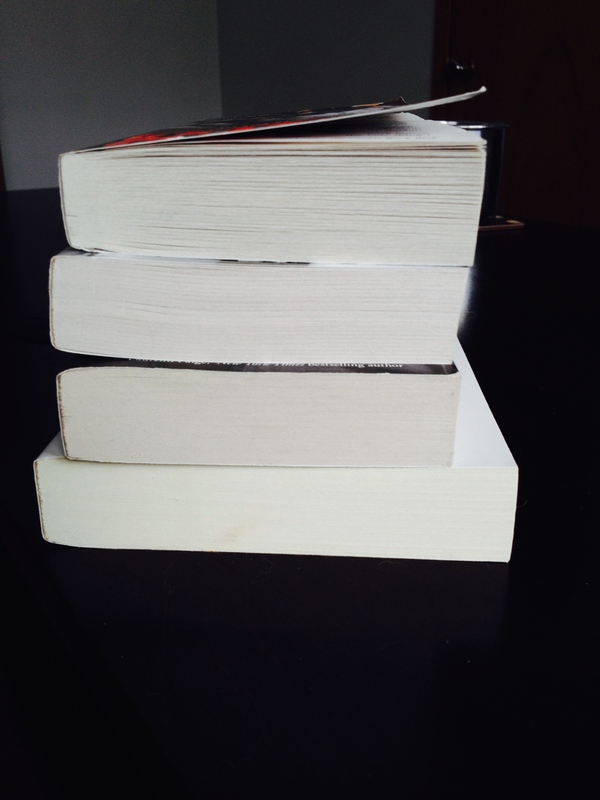 “How many books do you have?” they inevitably ask. “Not enough,” I tell them. Do they think I actually count them? I’ve already shouted out my favourite books but, though I have an opinion, I’m not a reviewer. However, I know some people who are (they also run some awesome blogs!). I thought I’d share what the best reviewers think. First, one of my favourites, Andrea Whittle. She’s a pro. You can tell because where I would say: great book, she explains why it’s such a great book with amazing literary skill. That skill is not something anyone’s born with, it takes years of serious reading and writing. She’s read a few books and knows a thing or two. If she says a book is good, it’s good. Then, the BookChick. She’s a tough, no nonsense reviewer and, even she admits, she doesn’t give out 5 stars just because the cover is pretty. She has listed down the top 15 and there are some beauties in there. Now, one of my favourite sites, All about Romance, also has a list. The top 100. Here’s the link: http://likesbooks.com/top1002013results.html. They did a round up of their readers top-ever books. It’s really worth a read because you can find some gems you never knew were there. Finally, Goodreads has their top winners of 2013 in categories for your convenience. Here’s that link:https://www.goodreads.com/choiceawards/best-books-2013.